Definition at line 48 of file llpaneldirbrowser.h. Definition at line 79 of file llpaneldirbrowser.cpp. Definition at line 111 of file llpaneldirbrowser.cpp. Definition at line 1041 of file llpaneldirbrowser.cpp. References CLASSIFIED_CODE, LLControlGroup::getString(), gViewerArt, list, llformat(), LLUUID::set(), and type. Definition at line 1218 of file llpaneldirbrowser.cpp. References LLPanel::childDisable(), LLPanel::childGetListInterface(), and list. Definition at line 1065 of file llpaneldirbrowser.cpp. References AUCTION_CODE, FOR_SALE_CODE, LLControlGroup::getString(), gViewerArt, PLACE_CODE, and LLUUID::set(). Reimplemented in LLPanelDirClassified, LLPanelDirEvents, LLPanelDirFindAll, LLPanelDirFindAllOld, LLPanelDirGroups, LLPanelDirPlaces, and LLPanelDirPopular. Definition at line 120 of file llpaneldirbrowser.cpp. References LLPanel::childGetListInterface(), LLPanel::childHasFocus(), LLPanel::childSetFocus(), LLPanel::draw(), LLFrameTimer::getElapsedTimeF32(), LLView::getVisible(), list, mDidAutoSelect, mLastResultTimer, NULL, onCommitList(), and TRUE. Referenced by LLPanelDirPopular::draw(), LLPanelDirPlaces::draw(), LLPanelDirGroups::draw(), LLPanelDirFindAllOld::draw(), LLPanelDirFindAll::draw(), LLPanelDirEvents::draw(), and LLPanelDirClassified::draw(). Definition at line 68 of file llpaneldirbrowser.h. Referenced by LLPanelDirLand::performQuery(), LLPanelDirPlaces::queryCore(), and LLPanelDirPopular::requestPopular(). Definition at line 264 of file llpaneldirbrowser.cpp. References LLPanelEvent::getEventID(), mFloaterDirectory, and LLFloaterDirectory::mPanelEventp. Definition at line 276 of file llpaneldirbrowser.cpp. References LLSD::asString(), LLSD::asUUID(), LLPanel::childGetListInterface(), LLPanel::childGetValue(), list, and mResultsContents. Definition at line 1107 of file llpaneldirbrowser.cpp. References addClassified(), LLPanel::childGetListInterface(), LLPanelClassified::getClassifiedID(), LLPanelClassified::getClassifiedName(), LLPanelClassified::initNewClassified(), list, mFloaterDirectory, LLFloaterDirectory::mPanelClassifiedp, LLPanelClassified::reset(), LLView::setVisible(), and TRUE. Definition at line 151 of file llpaneldirbrowser.cpp. References LLPanel::childShow(), mResultsPerPage, mSearchStart, and performQuery(). Definition at line 225 of file llpaneldirbrowser.cpp. Definition at line 217 of file llpaneldirbrowser.cpp. Definition at line 1187 of file llpaneldirbrowser.cpp. Referenced by LLPanelDirEvents::onCommitMature(), LLPanelDirPlaces::postBuild(), LLPanelDirPeople::postBuild(), LLPanelDirLand::postBuild(), LLPanelDirGroups::postBuild(), LLPanelDirEvents::postBuild(), and LLPanelDirClassified::postBuild(). Definition at line 291 of file llpaneldirbrowser.cpp. References EVENT_CODE, FALSE, list, S32, and type. Referenced by draw(), onVisibilityChange(), postBuild(), and selectByUUID(). Reimplemented in LLPanelDirFindAllOld, LLPanelDirPeople, and LLPanelDirPlaces. Definition at line 1228 of file llpaneldirbrowser.cpp. Referenced by LLPanelDirPlaces::postBuild(), LLPanelDirPeople::postBuild(), LLPanelDirGroups::postBuild(), and LLPanelDirFindAllOld::postBuild(). Definition at line 1244 of file llpaneldirbrowser.cpp. References NULL, onCommitList(), and LLView::onVisibilityChange(). Reimplemented in LLPanelDirClassified, LLPanelDirEvents, LLPanelDirGroups, LLPanelDirLand, LLPanelDirPeople, and LLPanelDirPlaces. Definition at line 66 of file llpaneldirbrowser.h. Referenced by nextPage(), and prevPage(). Reimplemented in LLPanelDirClassified, LLPanelDirEvents, LLPanelDirFindAll, LLPanelDirFindAllOld, LLPanelDirGroups, LLPanelDirLand, LLPanelDirPeople, LLPanelDirPlaces, and LLPanelDirPopular. Definition at line 98 of file llpaneldirbrowser.cpp. References LLPanel::childHide(), LLPanel::childSetAction(), LLPanel::childSetCommitCallback(), onClickNext(), onClickPrev(), onCommitList(), and TRUE. Referenced by LLPanelDirPopular::postBuild(), LLPanelDirPlaces::postBuild(), LLPanelDirPeople::postBuild(), LLPanelDirLand::postBuild(), LLPanelDirGroups::postBuild(), LLPanelDirFindAllOld::postBuild(), LLPanelDirFindAll::postBuild(), LLPanelDirEvents::postBuild(), and LLPanelDirClassified::postBuild(). Definition at line 161 of file llpaneldirbrowser.cpp. References LLPanel::childSetVisible(), mResultsPerPage, mSearchStart, and performQuery(). Definition at line 844 of file llpaneldirbrowser.cpp. References _PREHASH_QueryReplies, CLASSIFIED_CODE, DB_PARCEL_NAME_SIZE, FALSE, gAgent, gDirBrowserInstances, LLAgent::getID(), LLMessageSystem::getNumberOfBlocksFast(), LLMessageSystem::getS32(), LLMessageSystem::getString(), LLMessageSystem::getU32(), LLMessageSystem::getUUID(), i, list, llendl, llwarns, LLCtrlSelectionInterface::OP_DELETE, S32, and TRUE. Definition at line 643 of file llpaneldirbrowser.cpp. References ADD_SORTED, EVENT_CODE, EVENT_FLAG_MATURE, FALSE, gDirBrowserInstances, LLControlGroup::getBOOL(), LLMessageSystem::getNumberOfBlocks(), LLControlGroup::getString(), LLMessageSystem::getString(), LLMessageSystem::getU32(), LLMessageSystem::getUUID(), gSavedSettings, gViewerArt, i, LLUUID::isNull(), list, llendl, llformat(), llwarns, MAX_STRING, LLCtrlSelectionInterface::OP_DELETE, S32, LLUUID::set(), and TRUE. Definition at line 760 of file llpaneldirbrowser.cpp. References _PREHASH_GroupID, _PREHASH_GroupName, _PREHASH_Members, _PREHASH_QueryData, _PREHASH_QueryID, _PREHASH_QueryReplies, _PREHASH_SearchOrder, LLUUID::asString(), DB_GROUP_NAME_BUF_SIZE, FALSE, gDirBrowserInstances, LLMessageSystem::getF32Fast(), LLMessageSystem::getNumberOfBlocksFast(), LLMessageSystem::getS32Fast(), LLControlGroup::getString(), LLMessageSystem::getStringFast(), LLMessageSystem::getUUIDFast(), GROUP_CODE, gViewerArt, i, LLUUID::isNull(), list, LLCtrlSelectionInterface::OP_DELETE, S32, LLUUID::set(), and TRUE. Definition at line 913 of file llpaneldirbrowser.cpp. References LLUUID::asString(), count, FALSE, gDirBrowserInstances, LLMessageSystem::getBOOL(), LLControlGroup::getBOOL(), LLMessageSystem::getNumberOfBlocks(), LLMessageSystem::getS32(), LLMessageSystem::getString(), LLMessageSystem::getUUID(), gSavedSettings, i, LLUUID::isNull(), list, llformat(), MAX_STRING, mHaveSearchResults, LLCtrlSelectionInterface::OP_DELETE, S32, TRUE, and type. Definition at line 403 of file llpaneldirbrowser.cpp. References _PREHASH_AgentID, _PREHASH_FirstName, _PREHASH_LastName, _PREHASH_QueryData, _PREHASH_QueryID, _PREHASH_QueryReplies, LLUUID::asString(), AVATAR_CODE, DB_FIRST_NAME_BUF_SIZE, DB_LAST_NAME_BUF_SIZE, FALSE, gDirBrowserInstances, LLMessageSystem::getNumberOfBlocksFast(), LLControlGroup::getString(), LLMessageSystem::getStringFast(), LLMessageSystem::getUUIDFast(), gViewerArt, i, LLUUID::isNull(), list, LLCtrlSelectionInterface::OP_DELETE, S32, LLUUID::set(), and TRUE. Definition at line 486 of file llpaneldirbrowser.cpp. References LLUUID::asString(), count, FALSE, gDirBrowserInstances, LLMessageSystem::getBOOL(), LLMessageSystem::getF32(), LLMessageSystem::getNumberOfBlocks(), LLMessageSystem::getString(), LLMessageSystem::getUUID(), i, LLUUID::isNull(), list, llformat(), MAX_STRING, LLCtrlSelectionInterface::OP_DELETE, S32, TRUE, and type. Definition at line 564 of file llpaneldirbrowser.cpp. References LLUUID::asString(), count, FALSE, gDirBrowserInstances, LLMessageSystem::getF32(), LLMessageSystem::getNumberOfBlocks(), LLControlGroup::getString(), LLMessageSystem::getString(), LLMessageSystem::getUUID(), gViewerArt, i, LLUUID::isNull(), list, llformat(), MAX_STRING, LLCtrlSelectionInterface::OP_DELETE, POPULAR_CODE, S32, LLUUID::set(), and TRUE. Definition at line 1135 of file llpaneldirbrowser.cpp. Definition at line 170 of file llpaneldirbrowser.cpp. Definition at line 232 of file llpaneldirbrowser.cpp. References LLPanel::childGetListInterface(), list, mWantSelectID, NULL, onCommitList(), and LLUUID::setNull(). Referenced by LLFloaterDirectory::showClassified(), LLFloaterDirectory::showLandForSale(), and LLFloaterDirectory::showPopular(). Definition at line 252 of file llpaneldirbrowser.cpp. References mFloaterDirectory, LLFloaterDirectory::mPanelEventp, LLPanelEvent::setEventID(), LLView::setVisible(), and TRUE. Definition at line 1198 of file llpaneldirbrowser.cpp. References LLMessageSystem::addS32(), LLMessageSystem::addString(), LLMessageSystem::addU32(), LLMessageSystem::addUUID(), gAgent, LLAgent::getID(), LLAgent::getSessionID(), LLMessageSystem::newMessage(), LLMessageSystem::nextBlock(), and LLAgent::sendReliableMessage(). Referenced by LLPanelDirFindAllOld::onClickSearch(), LLPanelDirPeople::performQuery(), LLPanelDirGroups::performQuery(), and LLPanelDirEvents::performQueryOrDelete(). Definition at line 1160 of file llpaneldirbrowser.cpp. References LLPanel::childDisable(), LLPanel::childGetListInterface(), FALSE, gDirBrowserInstances, LLUUID::generate(), LLFloaterDirectory::hideAllDetailPanels(), list, mFloaterDirectory, mHaveSearchResults, mResultsReceived, mSearchID, LLCtrlSelectionInterface::OP_DELETE, and updateResultCount(). Referenced by LLPanelDirPeople::performQuery(), LLPanelDirLand::performQuery(), LLPanelDirGroups::performQuery(), LLPanelDirClassified::performQuery(), LLPanelDirEvents::performQueryOrDelete(), LLPanelDirPlaces::queryCore(), and LLPanelDirPopular::requestPopular(). Definition at line 326 of file llpaneldirbrowser.cpp. References AUCTION_CODE, AVATAR_CODE, CLASSIFIED_CODE, EVENT_CODE, FOR_SALE_CODE, GROUP_CODE, llendl, llwarns, mFloaterDirectory, LLFloaterDirectory::mPanelAvatarp, LLFloaterDirectory::mPanelClassifiedp, LLFloaterDirectory::mPanelGroupHolderp, LLFloaterDirectory::mPanelGroupp, LLFloaterDirectory::mPanelPlacep, LLFloaterDirectory::mPanelPlaceSmallp, ONLINE_STATUS_NO, PLACE_CODE, POPULAR_CODE, LLPanelPlace::resetLocation(), LLPanelClassified::sendClassifiedInfoRequest(), LLPanelAvatar::setAvatarID(), LLPanelClassified::setClassifiedID(), LLPanelGroup::setGroupID(), LLPanelPlace::setParcelID(), LLView::setVisible(), showEvent(), and TRUE. Definition at line 389 of file llpaneldirbrowser.cpp. References LLFloaterDirectory::hideAllDetailPanels(), mFloaterDirectory, LLFloaterDirectory::mPanelEventp, LLPanelEvent::setEventID(), LLView::setVisible(), and TRUE. Definition at line 1253 of file llpaneldirbrowser.cpp. References LLPanel::childHide(), LLPanel::childSetVisible(), LLView::getName(), mResultsPerPage, and mResultsReceived. Definition at line 178 of file llpaneldirbrowser.cpp. References LLPanel::childEnable(), LLPanel::childGetListInterface(), LLPanel::childIsVisible(), LLPanel::childSetValue(), list, llformat(), mHaveSearchResults, mResultsPerPage, LLCtrlSelectionInterface::OP_DESELECT, and S32. Definition at line 141 of file llpaneldirbrowser.h. Referenced by LLPanelDirGroups::performQuery(), LLPanelDirPopular::postBuild(), LLPanelDirPlaces::postBuild(), and LLPanelDirLand::postBuild(). Definition at line 140 of file llpaneldirbrowser.h. 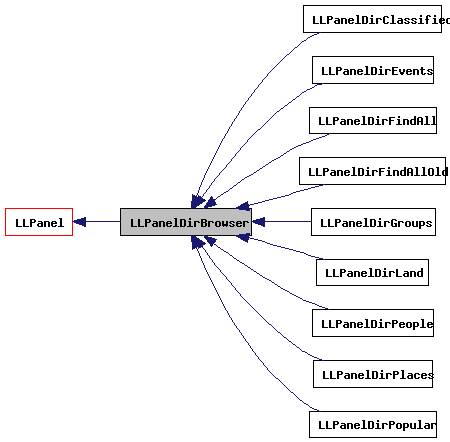 Referenced by LLPanelDirGroups::performQuery(), LLPanelDirPopular::postBuild(), LLPanelDirPlaces::postBuild(), LLPanelDirLand::postBuild(), and LLPanelDirEvents::postBuild(). Definition at line 154 of file llpaneldirbrowser.h. Definition at line 157 of file llpaneldirbrowser.h. Referenced by getSelectedEventID(), newClassified(), selectEventByID(), setupNewSearch(), showDetailPanel(), and showEvent(). Definition at line 153 of file llpaneldirbrowser.h. Referenced by processDirLandReply(), setupNewSearch(), and updateResultCount(). Definition at line 155 of file llpaneldirbrowser.h. Definition at line 149 of file llpaneldirbrowser.h. Referenced by LLPanelDirFindAll::LLPanelDirFindAll(), LLPanelDirFindAllOld::LLPanelDirFindAllOld(), LLPanelDirGroups::LLPanelDirGroups(), LLPanelDirPeople::LLPanelDirPeople(), LLPanelDirPlaces::LLPanelDirPlaces(), LLPanelDirPlaces::performQuery(), LLPanelDirPeople::performQuery(), and LLPanelDirGroups::performQuery(). Definition at line 151 of file llpaneldirbrowser.h. Definition at line 146 of file llpaneldirbrowser.h. Referenced by LLPanelDirEvents::LLPanelDirEvents(), nextPage(), prevPage(), showNextButton(), and updateResultCount(). Definition at line 147 of file llpaneldirbrowser.h. Referenced by setupNewSearch(), and showNextButton(). Definition at line 138 of file llpaneldirbrowser.h. Referenced by getSearchID(), LLPanelDirPeople::performQuery(), LLPanelDirGroups::performQuery(), LLPanelDirClassified::performQuery(), LLPanelDirEvents::performQueryOrDelete(), setupNewSearch(), and ~LLPanelDirBrowser(). Definition at line 144 of file llpaneldirbrowser.h. Referenced by nextPage(), LLPanelDirPeople::performQuery(), LLPanelDirLand::performQuery(), LLPanelDirGroups::performQuery(), LLPanelDirClassified::performQuery(), LLPanelDirEvents::performQueryOrDelete(), prevPage(), LLPanelDirPlaces::queryCore(), and resetSearchStart(). Definition at line 139 of file llpaneldirbrowser.h.